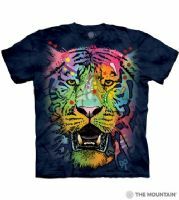 If you love bright colours and tigers you'll love this pop art big cat t-shirt! Artist Dean Russo uses bright colours and shapes on his tiger portrait. This tiger t-shirt is part of the Big Face collection from The Mountain®. The classic cut of the Russo Tiger shirt means it's suitable for women and men.